Does overloading sound unfamiliar or strange? Well, have you ever used the TO_CHAR function? If so, then you have already been enjoying the creature comforts of overloading. TO_CHAR converts both numbers and dates to strings. Have you ever wondered why you don’t have to call functions with names like TO_CHAR_FROM_DATE or TO_CHAR_FROM_NUMBER? Probably not. You probably just took TO_CHAR for granted, and that is how it should be. In reality, there are two different TO_CHAR functions (both defined in the STANDARD package): one to convert dates and another to convert numbers. The reason that you don’t have to care about such details and can simply execute TO_CHAR is that the PL/SQL runtime engine examines the kind of data you pass to TO_CHAR and then automatically figures out which of the two functions (with the same name) to execute. It’s like magic, only it’s better than magic: its intelligent software! When you overload, you take the first step towards providing a declarative interface to PL/SQL-based functionality. With a declarative approach, a developer does not write a program to obtain the necessary functionality. Instead, she describes what she wants and lets the underlying code handle the details (this follows the approach used by the SQL language). The process of overloading involves abstracting out from separate programs into a single action. A less common application of overloading offers a way for developers to specify very easily which of the overloaded programs should be executed. The best way to explain this technique is with an example. The PLVgen package allows you to generate PL/SQL source code, including procedures, functions, and packages. Let’s consider how to request the generation of a function. Overloading can greatly simplify your life and the lives of other developers. This technique consolidates the call interfaces for many similar programs into a single module name. This process transfers the burden of knowledge from the developer to the software. You do not have to try to remember, for instance, the six different names for programs adding values (dates, strings, Booleans, numbers, etc.) to various PL/SQL tables. Instead, you simply tell the compiler that you want to add and pass it the value you want added. PL/SQL and your overloaded programs figure out what you want to do and they do it for you. When you build overloaded modules, you spend more time in design and implementation than you might with separate, standalone modules. This additional up-front time will be repaid handsomely down the line. You and others will find that it is easier and more efficient to use your programs. Because the name was already used for a procedure, PL/SQL rejected the attempt to replace it with a function. The compiler would not interpret this second “create or replace” as an effort to create a second module of the same name. Modules must be overloaded within a particular context. A PL/SQL block provides a scope: anything declared in its declaration section can only be accessed within the execution and exception sections. A PL/SQL package also provides a context for the overloaded modules. There are several restrictions on how you can overload programs. When the PL/SQL engine compiles and runs your program, it has to be able to distinguish between the different overloaded versions of a program; after all, it can’t run two different modules at the same time. So when you compile your code, PL/SQL will reject any improperly overloaded modules. It cannot distinguish between the modules by their name, because by definition that is the same in all overloaded programs. Instead, PL/SQL uses the parameter lists of these sibling programs to determine which one to execute. As a result, the following restrictions apply to overloaded programs. The benefits and the beauty of overloading can be appreciated fully only by using overloaded programs — and then in most cases, you won’t even notice, because overloading hides the underlying complexity so you can concentrate on more important issues. You will, I hope, get a sense of the value of overloading from using — and perhaps even extending — PL/Vision. Do take some time to pursue the various spb files (the package bodies) and examine the many different examples of overloading you will find there. 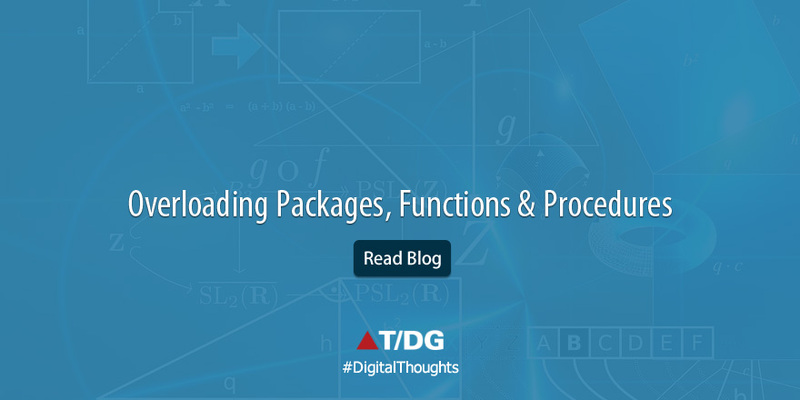 The more you overload your packaged procedures and functions, the more functionality you offer to your users. Where overloading is appropriate, it is also impossible to overdo your overloading. If you see another interesting and useful combination, if you see a way to simplify the way a user passes information to your package, then overload for it! It will always be the right thing to do; your biggest challenge will be in figuring out how to implement all these overloading’s in a modular and maintainable fashion.